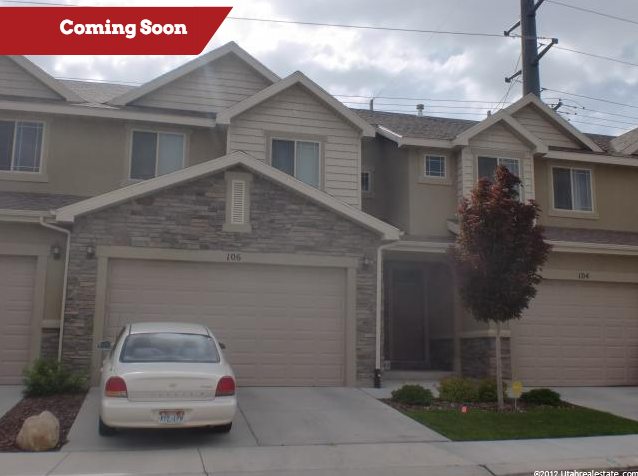 Get ready for this amazing townhome in American Fork about to be listed. Be part of the few on the See It First Program to see this before the masses. This home will hit the market the first week of January and with few homes on the market at this price and in this area it is good to move quickly and see it before everyone else. The home is located about a block away from State Street on 610 E, giving you an easy way on and off the freeway. It is located in a gated community that boasts a pool, hot tub, fitness room, clubhouse, and playground. Plus the HOA includes cable, internet, exterior maintenance, exterior insurance, landscaping, and snow removal. Plus you do get a small yard, so you can have those BBQs outback, let the kids out, or have a pet step outside. This townhome is spacious with 4 bedrooms (3 upstairs and 1 downstairs) and 2 and half bathrooms. The basement is finished giving you extra room to entertain, send the kids, or just have more space. The layout is amazing with the laundry room upstairs with the bedrooms. It has almost 2100 square feet plus a 2 car garage. Contact us to see this home first!